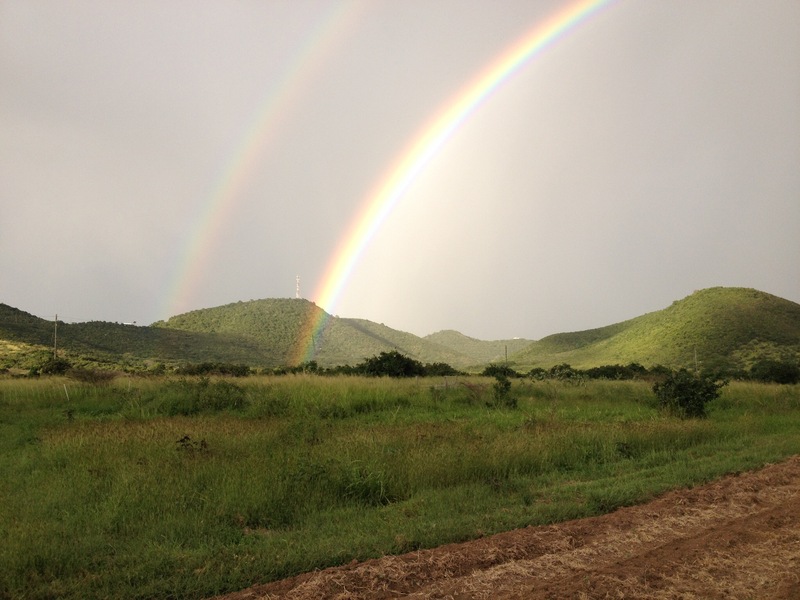 Is there any part of St. Croix that double rainbow didn’t visit on Thursday afternoon? Touchdown at ARTfarm! Good morning, wonderful customers!We’ve got lots of beautiful fresh salad greens in many sizes and flavors today, beautiful cooking greens for raw or cooked consumption; and a few flavor delights such as figs , serranos and cherry tomatoes for early birds. And the return of Wanda the wonderful honey lady, with her handcrafted Crucian Meads. She’s got a few beautiful little gift boxes with samplers in the various local fruit flavors that she concocts, beautifully packaged, and always with a friendly smile and vibe. She’s happy to fill custom orders for the holidays! If you’ve got a bit of the holiday sniffle, they make wonderful hot toddys at bedtime! Stop by her table! We’ll be here this morning, 10am – 12 noon. Looking forward to seeing you!